Join Us!!! We are looking for someone to help us cover Bermudas basketball. Please send us an e-mail. Makeup games took center stage in the Island Basketball League inside the CedarBridge Academy Gymnasium. Crossfire recorded only their second win of season by defeating the still winless Skyforce 56 - 36 , Crossfire were led to victory by Linden Jackson (183-G) with 27, while the Skyforce got 13 points from Jorel Smith. In the second game of the night it saw the defending champions Flyboys defeat the Hoopstars 55-47. Keiron Burgess scored 18 points for the Flyboys to lead them to the win, while the Hoopstars were led by Johnny Lowe with 17 points. Bermudian Caelin Peters hit a career high after scoring 37 points in Plymouth Whitemarsh Colonials' defeat to Malvern Preparatory School in the John Salmons Play by Play Classic showcase game on Saturday at the Plymouth Whitemarsh High School in Pennsylvania. Peters came out fast scoring ten points in the first quarter, and helping his Colonials to open an early 12-point lead against Malvern. Deuce Turner, a strong and speedy guard, responded heating up in the second quarter to finish the half with 15 points, leading Malvern to a 43-40 lead. In the second half, after trading baskets, Malvern opened a ten-point, which they carried going into the fourth period. With less than two minutes on the clock, Peters hit three, three-pointers, a layup, and two free throws to bring the Colonials within three at 86-89 with just seconds remaining in the game. After Turner made one of two free throws, the game ended without Plymouth Whitemarsh getting up a final shot. It was a high scoring, fast paced game, which Malvern won 90-86. Malvern's Turner scored a game high 41 points, including several three-point shots and shifty drives to the basket. Peters's 37 points marked the first time in his varsity career that he has eclipsed the 30-point mark. Peters has proven himself to be a solid performer but with injuries plaguing the Colonials, he has been called upon to pick things up in the scoring department, where he averages 15 point per game this season. At the conclusion of the game, Peters was named MVP for the losing side. This was the second MVP honour bestowed upon Peters this season as part of the Play by Play Classics showcase games. The first was at the Pete and Jameer Nelson showcase game against Bonner Pendergast, a team that featured Isaiah Wong., who has committed to the University of Miami. The Bermuda Under-19 basketball team just missed out on a place on the podium after finishing fourth at this week's Heartlake Winter Classic in Brampton, Ontario, Canada. Bermuda suffered a heavy 52-25 loss against St Thomas Aquinas in the third-place playoff at the Heart Lake High School on Wednesday. 'The third place game against St Thomas Aquinas would be a severe test due to the los Adam McDonald, their best ball handler, to injury in his last game,' Tim Trott, the Bermuda Basketball Association executive committee member, said. 'Also unable to play due to injury would be Jermayne Dears. 'The opposing team was one that like to use their athleticism and length to pressure teams into turnovers. 'The coaching staff had seen their press manhandle the previous day and devised a way to beat that that strategy. 'The team Bermuda was successful in advancing the ball at times but were unable to score. Other times they reverted to holding the ball or forcing difficult passes. 'All in all, the effort was there, but we were unable to get over the hump.' Bermuda were led at the eight-team tournament by head coach Kent Tacklyn . Tacklyn's charges started their campaign on the front foot with a comfortable 65-43 win over first round opponents Judith Nyman to advance to the Championship Draw where they lost to Bramalea 64-58 in an evenly fought contest. Bermuda were making their second straight appearance at the tournament having also competed at last year's event, winning one game and losing four. 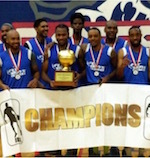 Tournament hosts Heart Lake High School were crowned champions after brushing aside Bramalea 64-39 in the championship game. The Bermuda Basketball Association's Under-19 team are targeting an improved performance in their second appearance in the Heartlake Winter Classic in Brampton, Ontario, Canada. Having appeared at the same tournament last year, the Bermudian team will be one of eight sides battling it out against one another between tomorrow and Wednesday at Heartlake High School. In preparation for the tournament, the team are taking part in two friendly matches, following up yesterday's scheduled encounter against Heartlake High School with a match against Brampton Christian High School today. With the advantage of learning from last year's experience, head coach Kent Tacklyn is looking for a better showing from his team this time around. 'The goal, obviously, is to win the tournament but a more realistic goal would be to at least finish as one of the top four teams,' he said. 'Last year the team won one game and lost four, but this year I believe the team can do better defensively.' The coach will be looking to lean on senior players, Jacy Lowery, Jermayne Dears, and Christian Liyange along with youngsters Adam MacDonald and Zakai Bean, returning from last year, to set the tone for the team, while he will also hope that first time players Seth Hardtman and Keishun Swan can have a big impact in the tournament.